Hello Everyone. Here I am back again already with another post. Thank you for calling in. 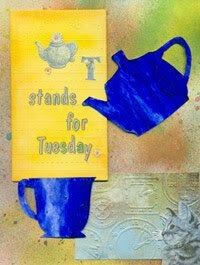 I am happy to announce our new theme at Tag Tuesday where Wendy is hosting this time and has chosen texture as the theme for the next two weeks. 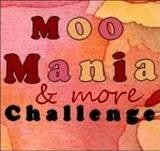 Thank you to everyone that joined in with the Animals challenge your tags were amazing and such a pleasure to visit your blogs. Hope to see you again in the next 2 weeks. Not sure when I will pop in this week are going to be away. I knitted a tag with different textures of wool. A lot of it isn't wool at all with cotton, silk, synthetic fibres and even some ribbon in there. Vic wanted to know what it was for? 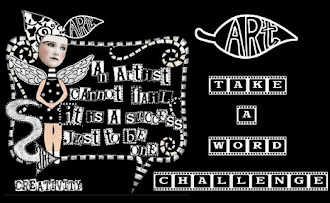 Here is another tag for the challenge something completely digital with textures cut into shapes in Paint Shop Pro. At Digitally Made anything goes but you have to add a quote this month. This is their second challenge and I was so thrilled to win the first one they had. It is so good to be relearning some of the things I did everyday way back when and they came automatically to me in those days. 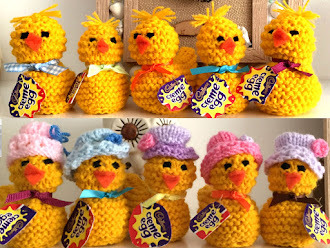 ohhh congrat with your winning..I absolutely LOVE your yarn tag its amazing what a creative idea. your digital work is great to. Wow, Chrissie, this is super post. The tag is just wonderful and so creative. It really is an eye catcher and its enough for Vic, too, I think LOL! The digital piece is very well done and you make wonderful moving effects (don't know in English the right name). 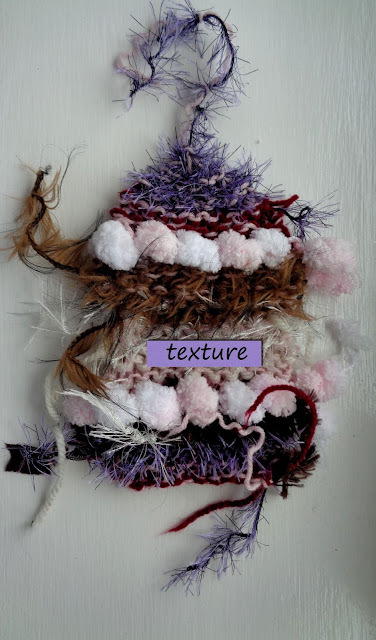 Your "texture" ideas are AMAZING - never had thought of knitting a tag! brilliant! Your digital page is fabulous as well! Oh, Chrissie, I simply adore that texture tag. It is out of this world. The digital one is great, too, but you can't beat that texture from the various ribbons and fibers. Your lovely digital page is amazing. I love the butterfly, too. It's an amazing piece and a great quote. Great texture created by the different yarns - brilliant idea, Chrissie! Your digital artwork is also fantastic - congratulations! Very creative on your texture tag. Congratulations on your digital win. I love it! Stay beautiful! Two lovely texture tags Chrissie, have a great time away. What a great knitted tag!! Talk about lots of texture and pretty colors too! Enjoy your time away. 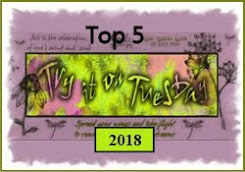 Wow Chrissie, your knitted, texture tag looks fabulous, what a super idea and so different to to your other lovely digital tag. The digital page looks beautiful as well, I love how you have added an animated butterfly. A lovely knitted tag Chrissie, such a great idea and I love the digital piece with it's lovely quote. More FABULOUS makes AND Congratulations on the win, so well deserved. What a stunning tag, the textures look fabulous. The digital designs are fantastic too. Congrats on your win!!! Wow your knitted artwork looks great and also the Tag. 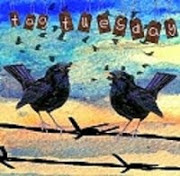 I also like your digital Artwork with the tue words. Your knitted fabric tag is just amazing. What an inspired idea - a treat for the fingertips as well as the eyes. Love the digital texture collection too. So pretty I love the butterfly. Love all your makes. I was particularly impressed with the digital piece. Thank you for sharing with Digitally Made! Lovely work. Thank you for joining the challenge at Digitally Made. Hope to see you again next time.